Featuring a new layout and some noteworthy rookie card options, 1955 Topps Baseball has aged well. 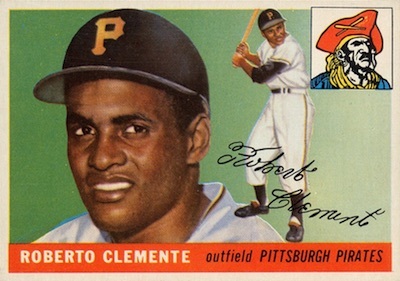 In additional to a good amount of Hall of Fame subjects, the '55 Topps set is place to find key rookie cards for Roberto Clemente and Sandy Koufax. 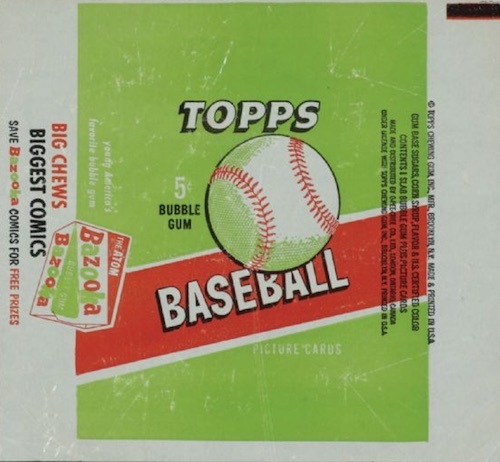 The 1955 Topps Baseball release consists of 206 cards, making it the second-smallest Topps baseball card set ever produced behind 1951 Topps. Measuring in at 3-3/4" by 2-5/8", 1955 Topps was the first horizontally-oriented sports design to be released by the card maker. The change was well received by collectors, as it was apparent that the orientation allowed for bigger player photos and the uncluttered inclusion of other key details. 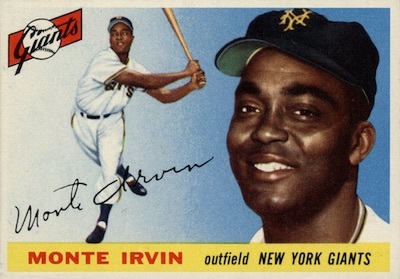 1955 Topps Baseball cards feature both a player profile photo and an action shot of each player on the card's front. 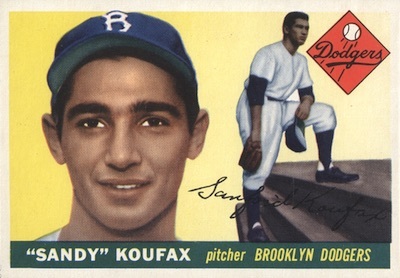 The dual image, first used the previous year, proved to be so popular that Topps went a stop further by colorizing the action photo as compared to the black-and-white version it utilized in 1954. Also taking up real estate on the card front is the team logo, facsimile signature and a colored bar across the bottom which highlights the player's name, position and team. The card's reverse provides detailed biographical and statistical information about the player. 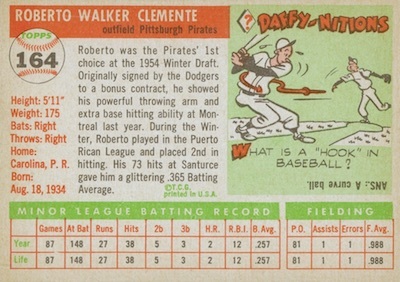 One-panel cartoons returned in 1955 Topps Baseball, this time in the form of a trivia question related to the team or player. Finally, each card back includes a short paragraph regarding the player's contribution to the team the previous season. What 1955 Topps Baseball lacks in overall checklist size, it makes up for in quality. The main attractions include rookie cards for Hall of Fame legends Sandy Koufax, Roberto Clemente and Harmon Killebrew. As was the case with the 1954 Topps set, Bowman's exclusive contracts with Mickey Mantle and Roy Campanella prevented their appearance in the 1955 release as well. 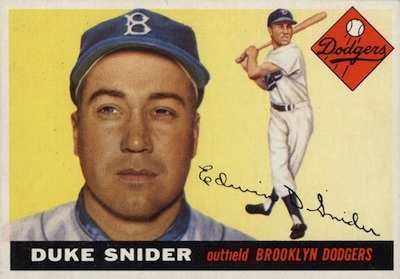 Fortunately enough, there are still plenty of big names in 1955 Topps Baseball, including Hank Aaron, Duke Snider, Yogi Berra, Willie Mays, Ted Williams, Jackie Robinson and Eddie Mathews. It is important to note the four cards originally intended for inclusion were ultimately left out. The players later were revealed to be Stan Musial (#175), Whitey Ford (#186), Bob Feller (#203) and Herb Score (#209). This explains why there are gaps in the 210-card set, and, as a result, four cards were double printed. 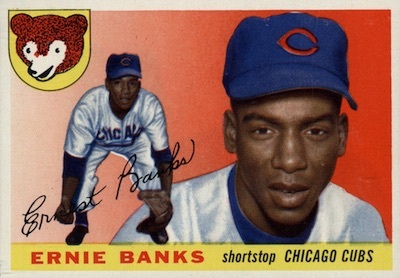 1955 Topps Baseball is largely free of variations. Frank Sullivan (#103) can be found with and without a large red dot over dotting the "i" in his signature. Similarly, Wally Moon (#67) is also available with or without a dot over the "e" in his signature. Neither sees any added premium. While the variation count is low, there are quite a few uncorrected errors in the set, including the wrong birthday for Hank Aaron. When it comes to scarcity, the 1955 Topps Baseball high numbers (#161-210) are by far the most challenging to find in high grade. 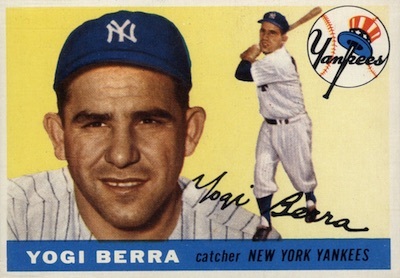 Many vintage collectors and set registry participants say that of all the 1950's Topps releases, these cards are the most difficult to find in NM-MT condition. 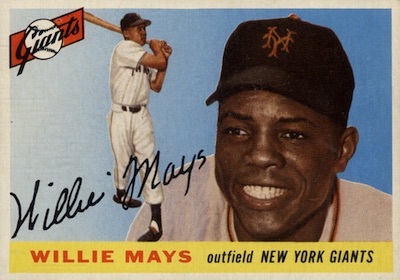 It should also be pointed out that cards #151-160 are considered near equally scarce, making cards for Willie Mays, Yogi Berra and Duke Snider generally more scarce than those of Ted Williams, Jackie Robinson or Hank Aaron. 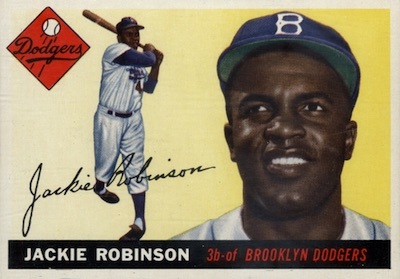 Those in the market for the release should be aware that 1955 Topps set is prone to doctoring of two key areas. The first uses a method to adjust the centering to the naked eye. By erasing the colored background at the edge of the white border, an unscrupulous dealer or collector can alter the presentation enough to significantly increase its value in raw condition. However, once submitted for grading and viewed under magnification the doctoring will be clearly evident. Additionally, spooning of the card backs, a process where a standard metal spoon is used in an attempt to remove the creases is another standard doctoring tactic familiar to the 1955 Topps Baseball set. Once again, when viewed under bright light and magnification, it is usually clear the manipulation has faded the color printing in the same area. Beyond the pack-issued cards, there are also rare panels issued as salesman samples. The three-card panels are found with advertising info for 1955 Topps Baseball or 1955 Topps Double Header. 1955 Topps #47 Henry Aaron (HOF) Milwaukee Braves - SGC 60 5 EX Sharp Card! 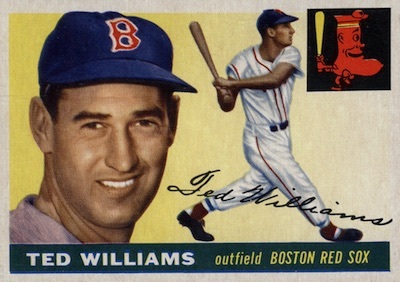 1955 Topps #2 Ted Williams Boston Red Sox SGC 7.5 NM+ HOF CENTERED!! 1955 Topps Hank Aaron Braves #47 SGC NM-MT+ 8.5 HOF CENTERED BLAZER!! 1955 TOPPS RED KRESS INDIANS #151--GRADED SGC 86=7.5=NEAR MINT PLUS--CENTERED!!! 206 cards. Shop for base cards on eBay. dont know if I can rate it correctly but a 5 because I just to a yard sale were it was going for 2$ with a page of 17 other cards and on closer inspection found it was signed by bill skowron so that is why this card is now my personal favorite only thing of is it was a little miss cut but it is still the upmost coolest card in my collection and I think ever!!! I really like the few cards from this set that I have. 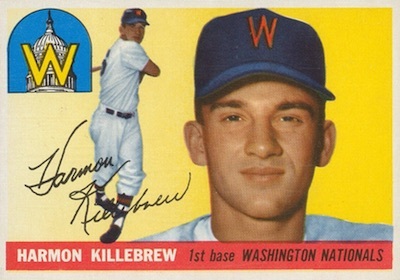 It’ll likely be the next Topps 50’s set that I try to tackle. 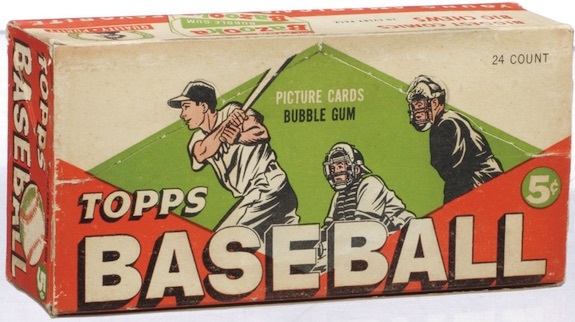 The 1955 Topps set is the smallest bubble gum card set of the 1950’s, lacking quite a few stars (like Mantle, Campanella, Musial, Ford, Feller, among others). It is a very challenging set to complete, because of the high number series (#161-210). The 1955 set is generally cheaper than other sets of the 1950’s. Fortunately, I completed the 1955 set sometime in the mid-1980’s, at a time when old baseball cards were a lot cheaper back then.